I am here with my very first post. I was waiting for a good occasion to start my blogging.. and today being Varalakshmi Vratam I prepared Kesari, Medu vada, Puliogare and Channa Sundal. And secondly my little one turned 9 months old today. So why not have a sweet start.. I always wanted to try this fruit kesari with fresh fruits rather adding store bought essence. I had only pineapple, apple and pomegranate. You can also add other fruits like papaya, orange and pear or any of your favorite fruits as long as they don't make the kesari gooey. Chop the apple and pineapple into small pieces and keep ready a tblsp of pomegranate seeds. Heat a pan and add 1 tblsp of ghee and 1 tblsp of oil. Fry the cashewnuts and raisins and keep them aside. Add the chopped fruits and saute them for a minute and transfer to a plate. In the same pan add the rava. Fry the rava till nice aroma comes. Do not burn or brown the rava. Transfer to a plate and keep it aside. Add 2 and 1/2 cups of water in the same pan and bring to boil. Add a pinch of salt and then start adding the rava slowly and keep stirring. Keep it in low flame as the rava starts boiling it will spread all over. Stir it well and ensure no lumps are formed. Cover the pan and cook for a couple of minutes until rava is done. Once rava is cooked well and all water is absorbed, add sugar and mix well. 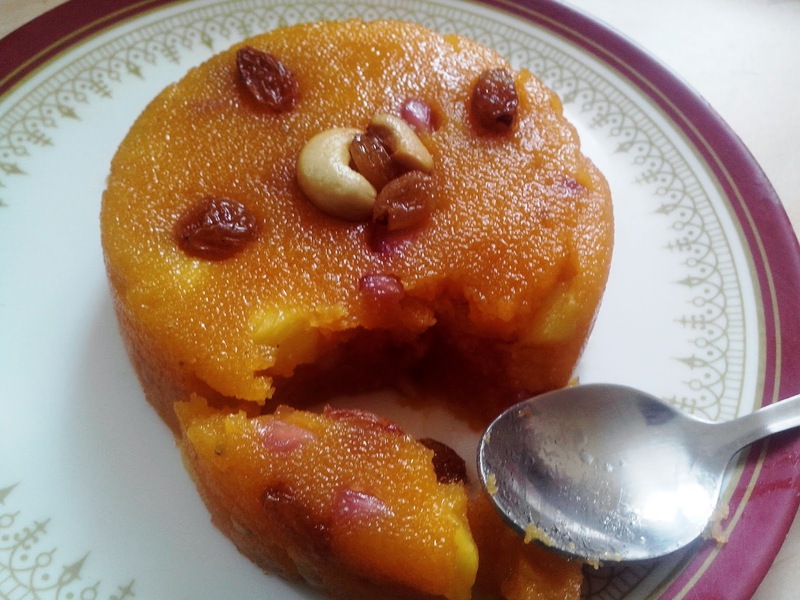 The sugar melts and the whole kesari becomes watery. Add a pinch of orange food color to it and keep stirring in medium flame. 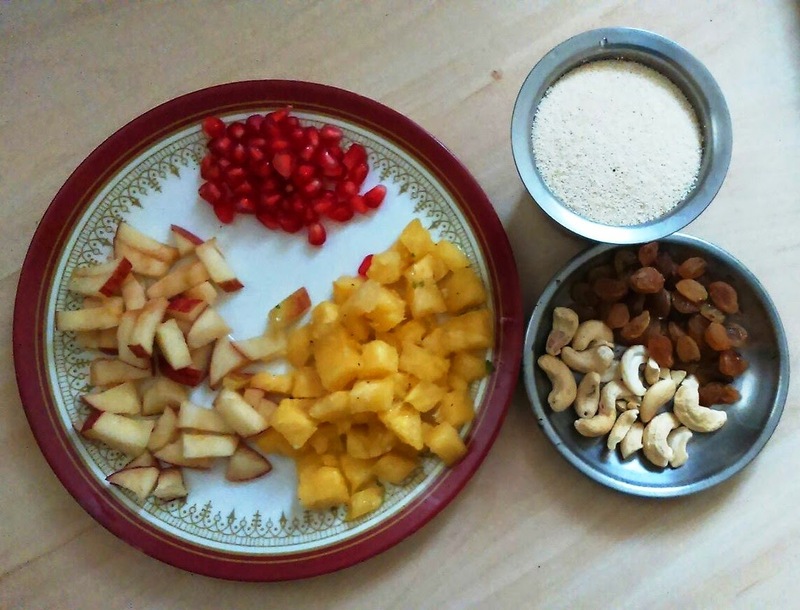 Now add the sauted apple and pineapple, pomegranate seeds and keep stirring until the kesari forms a nice mass. Add the remaining ghee, fried cashews and raisins and mix well. Add a pinch of cardamom powder for a nice flavor. 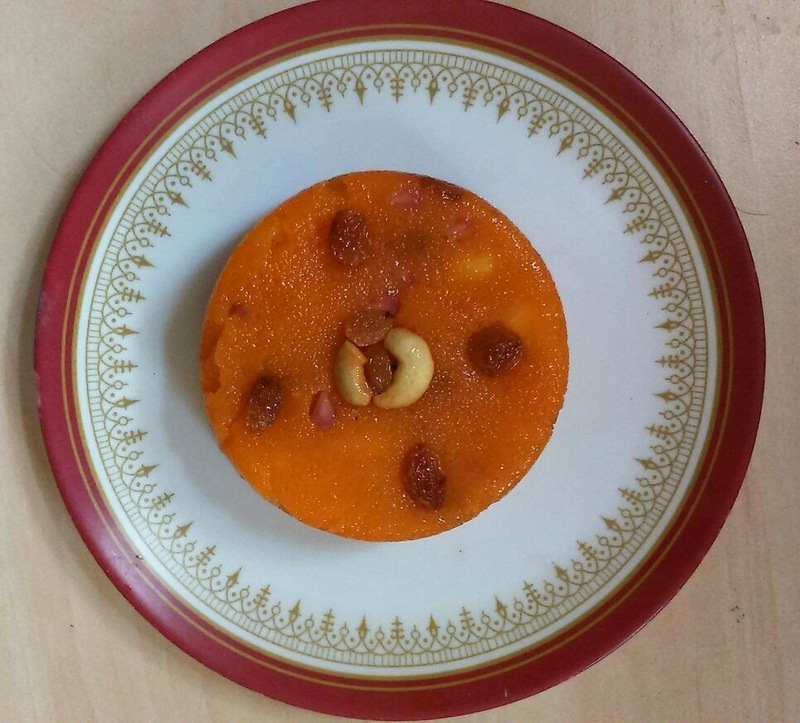 Switch off the flame when the kesari starts leaving the sides. See you again soon with another wonderful recipe. Pasta in White Sauce !